Over 1.6 million U.S. veterans of all ages live in Florida, which is the third largest population of veterans in the U.S.
As a veteran, or the surviving spouse of a veteran, you may be eligible for various lesser-known benefits and services provided by the U.S. Department of Veterans Affairs (the VA) and the State of Florida. Veterans Benefits for the Florida Resident explains VA and potentially applicable state benefits programs, who qualifies, how to get started and what to expect. Download a digital copy of the book by clicking here now. Want a Free printed copy of the book now and live in Florida? Complete with notes and an index. When you are ready, do schedule your no obligation, free telephone consultation with Attorney Frazier. A guide to federal and state VA benefits, the award-winning book, Veterans Benefits for the Florida Resident, by John R. Frazier, reveals and explains all possible benefits available to vets and their families living in the Sunshine State. (Largo, FL – May 30, 2018) — The Independent Book Publishers Association (IBPA) has announced that the book, Veterans Benefits for the Florida Resident, by Largo attorney and veterans advocate John R. Frazier, is a Silver Award winner in the Professional & Technical category of the 2017 IBPA Benjamin Franklin Awards™. Gold and silver winners were named for each of 54 categories during a dinner ceremony held April 6, 2018, at the Sheraton Austin Hotel at the Capitol in Austin, Texas. The distinguished indie book award program recognizes excellence in books published during 2017. Veterans Benefits for the Florida Resident is a self-help resource for veterans and their families. Over 1.6 million U.S. veterans of all ages live in Florida, which is the third largest population of veterans in the U.S. Many of these veterans, their surviving spouses or dependents may be eligible for disability compensation, pension, and other more obscure or “hidden” benefits and services provided by the U.S. Department of Veterans Affairs (the VA) and the State of Florida. About the IBPA gold and silver Award winners, IBPA CEO Angela Bole says, “This year’s list of IBPA Benjamin Franklin Award™ winners rests at the pinnacle of professional independent publishing. These are the best of the best.” Founded in 1983 to support independent publishers nationwide, Independent Book Publishers Association (IBPA) is the largest publishing trade association in the US. 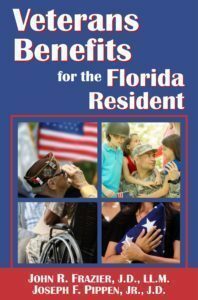 Veterans Benefits for the Florida Resident is available in trade softcover (ISBN 978-0-9907940-2-8) and as EPUB eBook (ISBN 978-0-9907940-3-5). Individuals can request the book from Amazon.com, BarnesndNoble.com, and they can find the best online price at AllBookStores.com (search by ISBN, then choose “compare prices”). Media contacts can receive a review copy or contact John R. Frazier through his publisher Cabo Azul Publications, LLC, by phone at (727) 586-3306, ext. 104, by fax at (727) 586-6276.